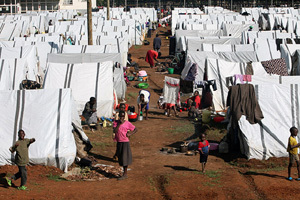 Five years after 1,300 Kenyans were killed and more than half a million displaced in the wake of a presidential election, one of the triggers of that violence, the inflammatory language of politicians, remains a serious threat to peace and stability as the country gears up for the next polls in March 2013. The 21 August massacre of 48 people in the Tana River district resulted in large part from the hate speech of politicians, according to several officials. "Hate speech is the precursor to violence and has [been] every electioneering year in this country. We must begin to seriously hold people accountable for inciting people to violence and hatred," Atsango Chesoni, executive director of the NGO Kenya Human Rights Commission (KHRC), told IRIN. A judicial report into 2008's post-election violence said political rallies, vernacular radio stations, leaflets and mobile phone texting services had all been used by political and even religious leaders to transmit messages that contributed to the violence. Joshua Arap Sang, a presenter on a local-language radio station, is one of four Kenyans charged by the International Criminal Court (ICC) of committing crimes against humanity during the last general election; his charges relate to the alleged dissemination of hate speech. In an effort to stem political and ethnic violence, the Kenya National Cohesion and Integration Commission (NCIC) was set up in 2008 to promote ethnic harmony and to "investigate complaints of ethnic or racial discrimination or any issue affecting ethnic and racial relations". It has since recommended that the Director of Public Prosecution indict at least six politicians - two of them cabinet ministers - and three musicians for hate speech. Section 13 of the 2008 National Cohesion and Integration Act, which established the Commission, criminalizes the use of hate speech and bars the use of threatening, abusive or insulting words or behaviour in any medium if they are intended to spur ethnic hatred. The regulatory National Communications Commission of Kenya has drafted guidelines that put the responsibility of filtering out inflammatory text-messages on mobile phone service providers. It has also banned the use of any language other than Swahili and English - the country's two official languages - when sending political text messages during the designated campaign period. The police have also been provided with audio recorders to monitor any hate speech at public gatherings. does the risk of slipping back into old habits. "The environment for the next General Election is becoming increasingly divisive as politicians continue to mobilize along ethnic lines. The trials at the International Criminal Court remain a divisive issue, with discourses for and against the ICC," the report found. "These divisions are feeding into the electoral environment through mobilization of political support." There are drawbacks to tackling hate speech in the courts, according to Judith Musembi, a law lecturer at the University of Nairobi. "Successful prosecution of hate speech can help stop it, but the success depends on getting water-tight evidence, which is never easy due to the difference in interpreting what has been said," she told IRIN. Lack of such evidence led to charges being dropped against three politicians accused of using hate speech during a 2010 referendum on a new constitution. The 2008 law defines hate speech as that which advocates or encourages violent acts against a specific group, and creates a climate of hate or prejudice, which may, in turn, foster the commission of hate crimes. Part of the problem in enforcing this act is that “this definition is broad [so] providing evidence that passes the prosecutorial threshold is somewhat difficult” according to Abdullah Boru Halakhe, Horn of Africa analyst at the International Crisis Group. “Where can we draw the line between what constitute hate speech and infringement of freedom of expression?” he asked. This question runs through three cases now before the courts. Cabinet minister Chirau Ali Mwakwere, who stands accused of inciting hatred against “Arab” settlers who he said had taken land from indigenous coastal communities, claims his right of expression was being “grossly violated” by the case. And three Kikuyu musicians - whose songs praising presidential aspirant and ICC suspect Uhuru Kenyatta were termed by the Commission as “insulting” and “threatening” to the Luo community - say their prosecution amounts to a “criminal interpretation of artistic works”. Chesoni dismissed such a defence. “The Bill of Rights, which guarantees these freedoms, is also very clear on their limitations. We can't enjoy our rights by hurting others, and one can't use underlying historical injustices like land ownership as a pretext to incite people to violence," she said. But she conceded the ambiguity in utterances at the heart of hate crime cases was an issue. The Commission had had to bring in “expert witnesses to decipher what ordinary listeners might not understand in a given speech”. The songs in question, which have been condemned even by Kenyatta’s own party, are indeed laced with allusions - “this is year of the hyena”, “stop chasing the wind, Awgambo”, “when a man is seated he sees further than a boy on top of a tree” - that might be lost on those unfamiliar with Kikuyu culture. Another song suggests that Kenyatta should “kill” Luo presidential rival Raila Odinga - “an uncircumcised man who wants to push you there [the Hague] and take over your wife and all your wealth” - for his alleged role in bringing about the ICC prosecutions. Lawrence Mute, a commissioner at the Kenya National Commission on Human Rights, an autonomous government body, says the scope of the 2008 law is too narrow. "When you look at the NCIC Act, it is too focused on ethnicity, yet hate speech goes beyond ethnic or political incitement. When you are faced with hate speech targeted at gender, for instance, it becomes difficult to prosecute because under what law do you do it?" he asked. Mute also noted that despite the high-profile names currently linked to hate speech, the country's legal system has a poor track record of holding powerful officials to account. "You can only talk about deterrence when you have had successful prosecutions, but we have no track record at all in punishing high-level crime," he said. "We must ask whether the various institutions have the will to investigate and prosecute hate speech. As it is now, cases that have not been properly investigated are taken to court and are dismissed for lack of proper evidence." And according to KHRC’s Chesoni, the failure to prosecute means the crimes will continue. "There is a direct link between impunity and the behaviour of politicians who want to create an atmosphere of violence. People say, 'So and so got away with it and I can as well,'" she said. NCIC’s Lwanga noted that the "tendency to politicize prosecution of hate speech is a real threat". Whenever prominent individuals are linked to incidents of hate crime, there is a tendency for their supporters to claim that the cases are inspired more by political affiliation than by specific acts.